Orangetown Wastewater Treatment Facility - Orangetown, N.Y. 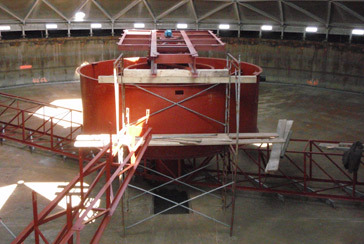 The scope of work includes constructing a new chlorine contact tank and modifying the existing headworks building, including the replacement of the grit removal system, mechanical bar screen, screw and belt conveyors. Also, the crew replaced the clarifier equipment, performed chemical feed modifications at the headworks building and installed new odor control equipment in three 85-foot-diameter primary clarifiers, two 85-foot-diameter secondary clarifiers and a 115-foot-diameter secondary clarifier.